Spanning Tree Protocol (STP) is an algorithm that provides path redundancy while preventing undesirable loops in a network that are created by multiple active paths between switches. Loops occur when there are alternate routes between two or more switches within the network. To establish path redundancy, STP creates a tree that spans all of the switches in an extended network, forcing redundant paths into a standby, or blocked state. STP allows only one active path at a time between any two switches therefore preventing loops while providing redundant links as a backup in case the initial link should fail. If STP cost changes, or if one network segment becomes unreachable, the spanning tree algorithm will reconfigure the spanning tree topology and reestablishes the link by activating the standby path. 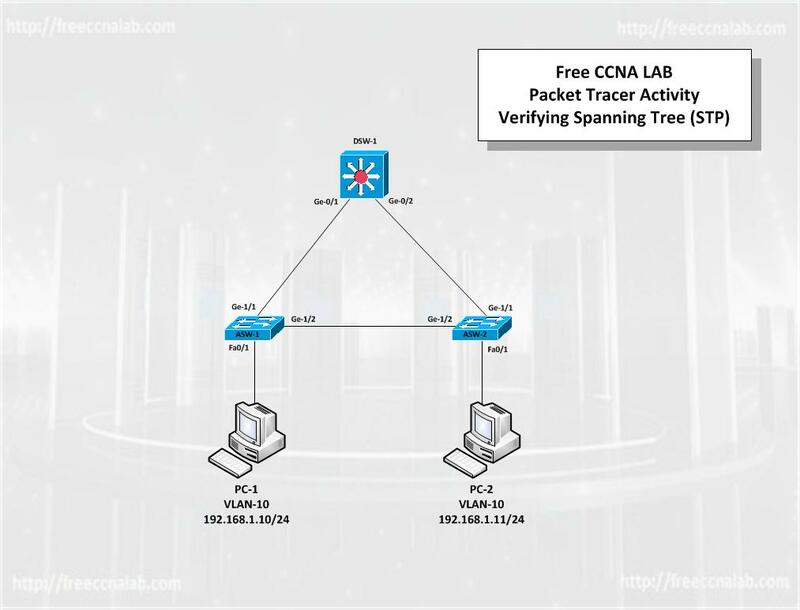 In this Free CCNA Lab we will use Cisco’s Packet Tracer and what we have learned in previous labs to configure VLAN Trunking Protocol and a VLAN on three switches in a fault tolerant configuration. We will then demonstrate Spanning Tree Protocol (STP) operation by shutting down functioning ports and observing the operation of the remaining ports. We will also use the show and ping commands to verify proper operation. Practice what we have learned previously by doing basic configuration. Practice configuring VTP and VLANs in the VTP domain. Learn to verify STP operation on Catalyst switches. Configure the hostname on all switched as shown in the network diagram. Configure no ip domain-lookup on all switches. Configure the enable secret password as cisco on all switches. Configure the console and vty password as sanfran on all switches. Configure the exec-timeout command to the console and virtual terminal lines. Save the running configuration to the NVRAM. Configure the interface subnet as shown in the network diagram. Configure the interfaces Gig0/1 and 0/2 on DSW1 to have dot1q encapsulation. Configure the interfaces Gig0/1 and 0/2 on DSW1 as trunking. Configure the interfaces Gig1/1 and 1/2 on ASW1 and ASW2 as trunking. Configure the VTP domain on all three switches as CCNA. Set the VTP domain password as cisco on all three switches. Configure DSW-1 as a VTP Server switch. Verify VTP Status on DSW1. Verify VTP Status on ASW1 and 2. Shut down the interface Gig1/2 on ASW1 Note the topology change. Display Spanning-Tree summary on ASW1. What is 12 + 6 ? If you have found these labs useful please help us keep this site running.